A fabulously versatile cake: it makes a lovely coffee morning offering; a great hot dessert with cream or custard; or just an afternoon treat. I use up all the bruised apples floating around at the bottom of the fruit bowl for it. Give it a try, it’s absolutely delicious. Original recipe taken from Family Circle Summer Recipes magazine. 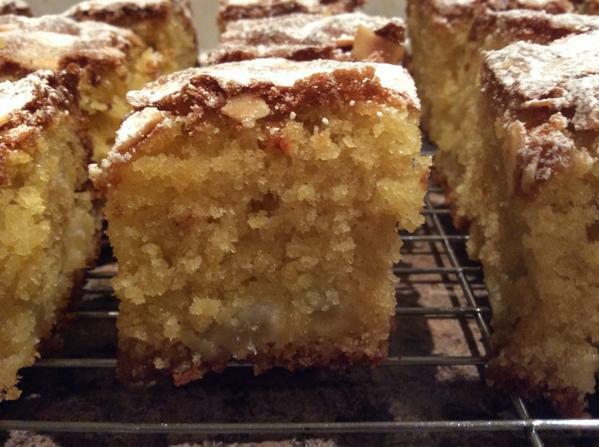 They recommend using a 900g loaf tin, but I used a square cake tin to make a more shallow cake. 350g dessert apples, peeled, cored & diced. Not cooking apples, they’ll break down too much. Dessert apples will stay in chunks. Preheat the oven to 180c, Gas 4. Grease the tin and line with baking parchment. Place the eggs, sugar, butter & vanilla essence in a stand mixer and whisk until smooth. Sift in the flour & baking powder, and add to the egg, whisk briefly then add the milk, ground almonds & marzipan. Gently whisk until mixed. Stir in the diced apple and pour the batter into the prepared tin. Level the top and sprinkle with the flaked almonds. Bake for 1 hr, checking after 50 minutes. If a skewer comes out clean, it’s done. If the cake’s still sticky but browning too much, pop a bit of foil over the top and return to the oven for a further 10 mins or until cooked. 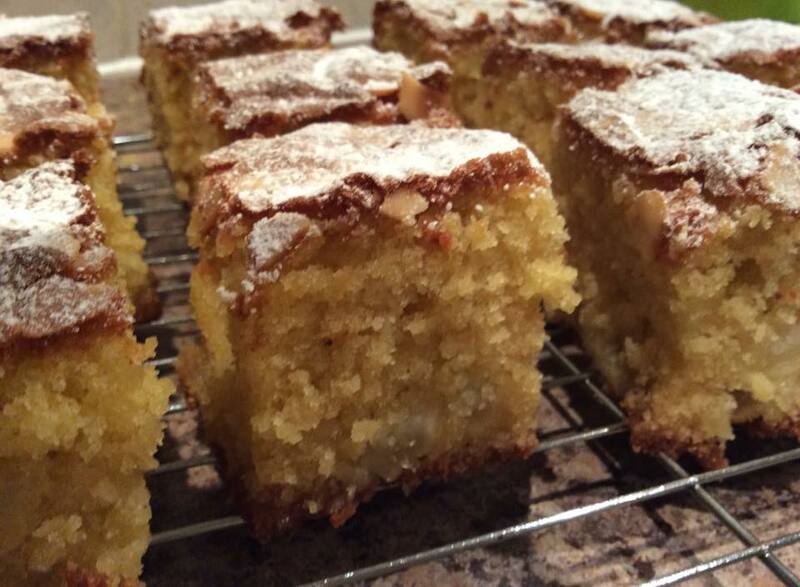 Leave to cool in the tin, then cut into squares, dust with icing sugar and serve.